Who doesn’t like Unicorns? I know Obama does, but that’s another t-shirt. I got “I’m Magic!” from my fiancée Becca this christmas, after Brad told me about it on twitter. The t-shirt comes from Tee and Toast, a wee little company from Northern Ireland. They concentrate on cute, childlike imagery, and there are quite a few things on their site that I’d very happily pick up for myself. They’re a really friendly company as well, as Becca and I found out when she had to request a replacement for the t-shirt I’d opened on Christmas morning. I wear an extra-large t-shirt, you see, but what I opened at Christmas was a large. I was quite disappointed, as I knew I’d never fit into a mere large t-shirt. So, thinking Becca had ordered a large in error, I asked her to email Tee and Toast and see if they’d be happy to replace it with an extra-large for us. They emailed back pretty quickly and told us that Becca had ordered an extra-large, but that they must have got confused making up the shirts in the Christmas rush. No worries though, if we sent back the t-shirt they’d send us out another in the correct size post-haste. So we did, and they did (and they even sent us a pound coin back with the new t-shirt to cover our return postage). Throughout the whole process I loved the customer service from Tee and Toast. They were lovely and friendly, and did everything they could to make sure I got the t-shirt back for last week’s Pub Standards (it came the day before, and I was very happy). I’d have no hesitation buying from them again, and in fact I have — I bought a Mr T “I pity the fool who don’t drink tea” hoodie for Becca for her birthday today. 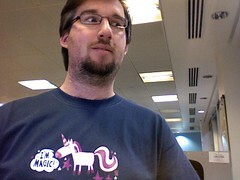 The t-shirt itself is a simple two colour heat transfer print of a lovely unicorn that knows it’s magic, and isn’t afraid to tell you. The only thing I wish is that it was available on a bright pink t-shirt for guys as well as girls. Oh well, you can’t have everything, can you? “I’m Magic!” is available from Tee and Toast for £20, but shipping is free within the UK. That’s fantastic – if only I’d known! You never know, I might have to pick myself up another one in pink at some point.